It’s that time again! On 28 April, waiting staff, barkeepers, porters, beer delivery drivers and kitchen staff will once again take part in the race held on Sunday shopping day. The start and finish lines are on the Kranzler Eck Berlin premises. The participants will compete over a distance of 400 metres down Kurfürstendamm, one side of which will be closed to traffic. Numerous hotels in the city are ready to face the challenge. TV chef Ralf Zacherl will be the special guest. In collaboration with Fitness First, Lululemon invites interested runners to free training at the Tiergarten park every Thursday at 6 p.m. Before setting off, participants can warm up in the Fitness First gym. Afterwards, runners can use the changing rooms, showers and sauna. The Hotel and Catering Association DEHOGA, which is a sponsor and supporter of the Kellnerlauf, will be presenting a job fair this year. Anyone looking for a career in hospitality can get advice at the information stand. It’s well worth taking part! The medal ceremonies will take place after the races. Along with fame and glory, the top finishers can look forward to prize money totalling 3,000 euros. Those wanting to participate can sign up online at www.kellnerderby.de or in person on the day. However, the number of runners is limited. On Sunday shopping day, 28 April 2019 at Kranzler Eck Berlin, from 11 a.m.
A stylish new ice cream parlour opens its doors in March 2019, directly at the entrance to the aviary garden. It follows an innovative self-service principle for freshly made ice cream that has never been seen before. Here, you decide what tastes good. Simply choose a cup size with a fixed price and then mix and match freshly made ice cream flavours to make your own creation. Finally, top it with delicious sauces and fresh ingredients like fruit and other toppings. Enjoy your unique creation! Prices are defined by the size of the cup, starting at €3.50 for the smallest cup, the “Short Cut”, and going up to €6.50 for the largest, the “Pot Belly”. Mr. Borella was the head confectioner of the Spanish ambassador in London, who published a ground-breaking book with instructions on how to make ice cream in 1772 – for everybody. This new knowledge offered many possibilities for experiments … Mr. Borella® brings this idea to life. YOU decide what tastes good … Compose your ice cream. The American outdoor lifestyle brand, Timberland, has opened a new store at the Kranzler Eck. Alongside the company’s traditional “Yellow Boot”, the store spanning some 123 square metres will be home to the latest shoe collections for men, women and children, as well as accessories such as belts, bags, hats and scarves. The Timberland collection not only impresses with its premium quality and first-class workmanship, but also with its diverse looks and special design. Timberland’s philosophy is to use recycled, organic and renewable materials, as the company has dedicated itself to protecting the environment. Come and meet us during the special Sunday shopping day! On Sunday, 27 January 2019, our shops will once again open their doors to customers between 1:00 p.m. and 6:00 p.m.
Every year, the Kurfürstendamm transforms into a sparkling winter wonderland. One true highlight is the spectacular Christmas bauble that will once again be resplendent on the roof of Kranzler Eck this year. With a diameter of some seven metres, the sparkling ornament is visible from afar. And don’t forget to try our wide range of food! Our newest addition is SAAMĪ – Taste of Asia. If you love authentic cuisine and Asian dishes, this is the right place for you. Carefully chosen, fresh, natural and high-quality ingredients are used to create Far Eastern taste sensations. Enjoy Asian hospitality in a relaxed atmosphere. And for those who still need to think about their Christmas presents, our doors will be open on Sunday, 23 December as well. From 1 pm to 6 pm, you will have the chance to find everything you need in our exclusive fashion stores. We wish you a peaceful Advent season, a merry Christmas and a happy new year! The boot expert Timberland has come up with something truly special to celebrate the 45th birthday of its all-time classic, the legendary Yellow Boot. Customers who bought a new pair of Timberland shoes from a participating vendor during the promotional period now have the chance to have a tattoo artist individually decorate these shoes as part of the Tattoo Experience Tour of Germany’s larger cities. What’s more, Timberland customers can get their very own campaign photo in the Tattoo Experience Cube. 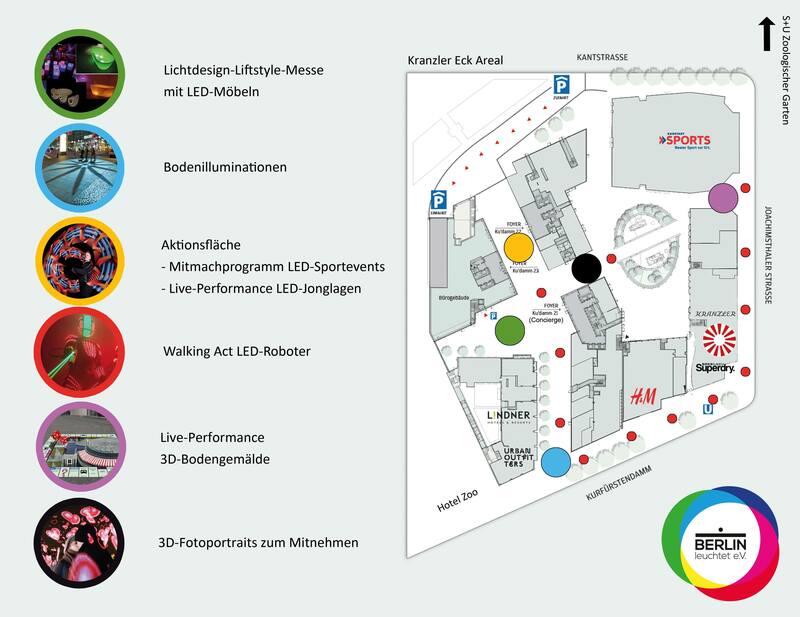 The Tattoo Experience Cube will call at the Kranzler Eck in Berlin on Friday, 16 November and on Saturday, 17 November. From 11 am to 8 pm on both days, visitors will get to choose from a large selection of motifs and letterings, which a tattoo artist will then engrave on the shoes. After all, the shoe must go on. Fancy trying the new Coca-Cola light taste for free? Here’s your chance! You can now experience the refreshing effect of Coca-Cola light taste for yourself at the Kranzler Eck in Berlin, where a promotional team will be handing out the perfectly cooled drink at a booth on Saturday, 27 October. See the light and enjoy a sip! The outdoor summer cinema (Open Air Sommerkino) was once again a huge hit in 2018, almost magnetically drawing in visitors to the Kranzler Eck in Berlin. The program was split evenly between current hits and golden classics of cinema, with precisely these cinematic gems drawing the biggest crowds. The organisers had arranged around 200 deckchairs, and they were almost always completely occupied. Considerable queues formed at the ticket booth, particularly for the weekend showings, meaning those who came early had the choice of the best seats. Many visitors took advantage of the opportunity to combine the film event with a stroll around the location. And visitors did not have to miss out on popular cinema snacks, with popcorn and cold beverages proving a sales hit. “There is no other shopping centre that has an outdoor cinema like this, at least not in City West. This helps us underscore that ‘real’ life still happens outdoors and not in front of a computer screen. When the weather plays along, an evening at the outdoor cinema in the Kranzler Eck is certainly one of the highlights in Berlin’s packed event calendar,” says the manager of the centre, Alexandra Meyder-Cyrus. This summer, cinema fans in Berlin will once again make the pilgrimage to the Kurfürstendamm. It is the sixth time to call “action” for 10 great blockbusters from the history of film, directly at the tradition-steeped cinema location of the Kurfürstendamm. For 10 days, around 200 seats at the Kranzler Eck in Berlin provide you with a comfortable place to enjoy films in a relaxed atmosphere. Entry is free and filmgoers can enjoy an unforgettable evening at the first and only outdoor cinema at the heart of the City West. Fresh popcorn and a wide range of culinary treats round off the cinematic experience. Trendy is the keyword when it comes to shopping: The Kranzler Eck is becoming a prime address at the Kurfürstendamm for a fashion-conscious audience. Why not use the opportunity to combine the film events with a shopping spree through the many shops? It’s that time again! On Saturday, 30 June 2018, Kranzler Eck Berlin invites you to the Kellnerlauf (Service Staff Race). Once again, waiting staff, barkeepers, bellhops, beer delivery drivers and kitchen staff will take part in the race. A new highlight for 2018 is the Kranzler Eck Runners’ Cup, an event exclusively for all Kranzler Eck Berlin tenants. Teams of three will take part in a 3 x 400 m relay race. The start and finish lines are on the Kranzler Eck Berlin premises. Popular Berlin radio host Ralf Zehr will fire the starting gun for the first race at 10:00 am. After the races have been run, Germany’s best-known hotel and food critic Heinz Horrmann will present the awards to the winners. All participants and defending champions are highly motivated, good weather has been booked and all visitors can look forward to a great day! All Berliners and visitors to the city are welcome to come and support the participants on their 400-metre-long course along the Kurfürstendamm. With the new concept, the management of the advertising community launched a cross-media campaign that addresses Berlin residents and tourists alike through advertisements, posters and radio advertisements as well as special events. The strategy is rounded off by social media offerings such as Facebook and Instagram. Fashion, food, sport and lifestyle will lie at the heart of the marketing of Kranzler Eck Berlin, with the objective of the emotional campaign being to further promote its image as an urban shopping and event location. The independent presence sets the complex apart and gives it a high recognition value, as well as awakening positive emotions. What’s more, the motifs are real “eye-catchers” and each of them highlights positive moments at Kranzler Eck. Contemporary Art of Fashion and Food – The concept is one of a relaxed atmosphere, cool brands, mega stores, trendy styles, casual outfits, the very finest fashion, delicious and healthy food, coffee shops, salad bars, smart eating and much more – meaning that Kranzler Eck is not your usual shopping centre. This Sunday, the 28.01.2018 we welcome you to a relaxing Sunday shopping in the Kranzler Eck. From 1 pm to 6 pm, you can discover the latest trends of the spring collection. During the shopping, our diverse restaurant offerings provide a strengthening. Whether you like burgers, salads, pasta or sushi, there is something for everyone. Throughout the event, all eyes were on the extravagant LED furniture and lighting systems. In addition to furniture, the focus was on event decorations and garden accessories. The special affect light has on well-being is clearly noticeable. Competent advisers were available to provide visitors with advice and assistance. Further highlights included floor illuminations and various live performances with 3D floor paintings, LED juggling lights, 3D photography and LED robots. The diversity of “Berlin leuchtet” (Berlin shines) in one place. Visitors were able to stop by and be inspired by the atmospheric lighting effects. Just under 20 shops invited visitors to Sunday shopping. Our wide range of restaurants provided refreshment during the shopping tour. Whether burgers, salads, sushi or pasta, there was something for everyone. After successful day of Sunday shopping, the evening ended in a relaxed atmosphere in our summer cinema. On 03.09. this year’s open-air spectacular ended with the film “Mad Max: Fury Road”. The fifth edition of the summer cinema showed blockbusters and hits from all genres. Whether drama, romance, comedy or action – there was something for everyone. A total of 200 sun loungers provided a relaxed cinema evening under open skies. Thanks to the many restaurants on the site, fine connoisseurs also got their money’s worth. The open-air spectacular ended with Sunday shopping on 3 September, on which all shops in the Kranzler Eck were open from 1 p.m. to 6 p.m.
Sam. 26.08. Bibi & Tina 2: Total verhext! For more information including about our summer cinema, please visit us on Facebook . On 17 and 18 June, the Kurfürstendamm was transformed into a true open-air museum for car lovers from all over Germany and Europe. Over 2,000 vintage cars came to the capital and put on an amazing display. Most of the shops on the Kurfürstendamm and Kranzler Eck opened their doors for Sunday shopping from 1–6 p.m.